Take a bite into this deluxe version of shortbread. The rich butter cookie base is topped with a layer of soft chewy caramel and a mouth-watering drizzle of chocolate. Worthy for the everyday millionaires amongst us. If you enjoy Twix® candy bars you will love this recipe. The taste is very similar! This makes a delicious gift for friends and family or even to mark a special occasion. Children can assist in the making of this scrumptious Millionaire’s Shortbread which is sure to delight everyone who gets to taste these decadent bars that are impressive in taste and cost. Melted chocolate, use your favorite baking or melting chocolate. Before you begin, preheat the oven to 350 degrees. Put the flour and salt into a bowl with the butter and crumble with your fingertips until it resembles breadcrumbs. Then add the sugar. Work it until a thick mixture is formed. Then press the ball of cookie dough into a greased baking until it is evenly distributed. Place baking pan into the oven for about 20-minutes or until golden on top. Take out the cookie base from the oven and leave it to cool in the pan. To make the rich caramel you need to put the condensed milk, butter and sugar into a saucepan on a low heat. Don't go anywhere, you need to constantly stir the mixture because it will burn easily. Once it becomes thickened and is a rich caramel color remove from the heat. Pour onto the cookie base ensuring it doesn't spill over the sides, spreading evenly. Melt chocolate (whatever type you want to use) in a glass bowl in the microwave. You can achieve this by microwaving in short bursts, stopping and removing the chocolate and stirring in-between until melted. Layer (or drizzle, as I did in the photo above) melted chocolate over the caramel topped cookie base. Cut into slices. 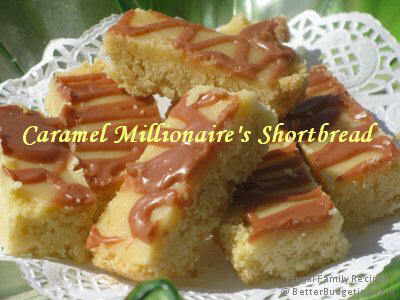 Present as a gift to friends and family by boxing your unforgettable Millionaire's Shortbread. Copyright © 2013 by Nadia Ali. All rights reserved.